A problem for everyone who uses centrifuges in the oil field is judging the centrifuge’s capacity, particularly in unweighted muds. Unfortunately the general attitude of the industry is to give hydraulic capacity (how much feed a centrifuge can physically swallow) without regard to the quality of performance a centrifuge can give at its “rated capacity”. For 50 years, centrifuge leasing companies have claimed higher and higher flow rates for essentially the same size centrifuges. In effect, we have “the biggest liar capacity game”, where each representative claims a higher capacity for their centrifuge compared to others. The loser is the poor driller who is faced with a bunch of sensationalized nonsense, and ultimately assumes they are all about the same, and pins all of his confidence on the quality or frequency of service he gets from the leasing company. Now that service is important, because poor service and set up can make the best centrifuge perform poorly, but it cannot make a poor centrifuge do a fine job at centrifuge feed rates the driller really does need to achieve. The most obvious measure of separation, the cut point, would be useful if it could be readily obtained, but it requires expensive equipment and a good operator to get reproducible numbers, and most of all, it requires a standard method. A major oil company’s excellent research department determined that D50 cut point of the feed was 2.3 microns. The centrate or liquid D50 was 1.78 and the D50 cut point was 12 microns. Unfortunately, without a standard method you cannot tell if the cut point claimed by one company is the same claimed by another company. In any event, since muds differ so much, how do you tell what a prospective centrifuge will do on your mud? The answer is, you cannot. Perhaps some day a company will have a computer software program that will be able to make such a prediction, and when they do, they’ll base performance on a combination of torque, centrifuge speed, centrifuge size, and of course mud properties. The capacity of a centrifuge is proportional to the square bowl speed. Doubling the speed gives four times the capacity. This is true for all centrifuges. Unfortunately, to successfully run at higher and higher speeds requires a lot of design effort to the point you reach a limitation regarding the laws of physics. It is important for the driller to recognize that the separation capacity of his centrifuge is so dependent upon bowl speed and, given machines of similar dimensions, the one which operates at the higher speed will do a better job. When a centrifuge rental proposal is drawn up, the bowl speed should be specified as well as the overall size of the centrifuge. If faster is better, why go slow? High speed has costs, not to the driller, but to the centrifuge owner. Suppose the centrifuge is one pound out of balance. If the centrifuge rotates at 900 RPM, the unbalanced load is 276 lbs, and this unbalanced load is carried by the bearings through to the frame. If it sped up too 1800 RPM, the unbalance load goes up to 1,104 lbs. To keep the centrifuge from shaking itself to death or an early bearing failure, higher speeds require better mechanical tolerances. Generally, to maintain these tolerances over a service life of many years, the centrifuge should be made from stainless steel. The second problem is stress. All of the mud in the centrifuge is pressing outward putting the bowl and hubs under stress. As the centrifuge is run faster and faster, the stresses build up and can cause catastrophic failure. No centrifuge should be run faster, with a heavier weight mud than it’s designer planned on, and in addition, the structural parts should be in good shape. Corrosion and wear can weaken a centrifuge to the point where it is unsafe at any useful speed. Higher speeds require high strength, corrosion resistant materials. The third problem is wear. 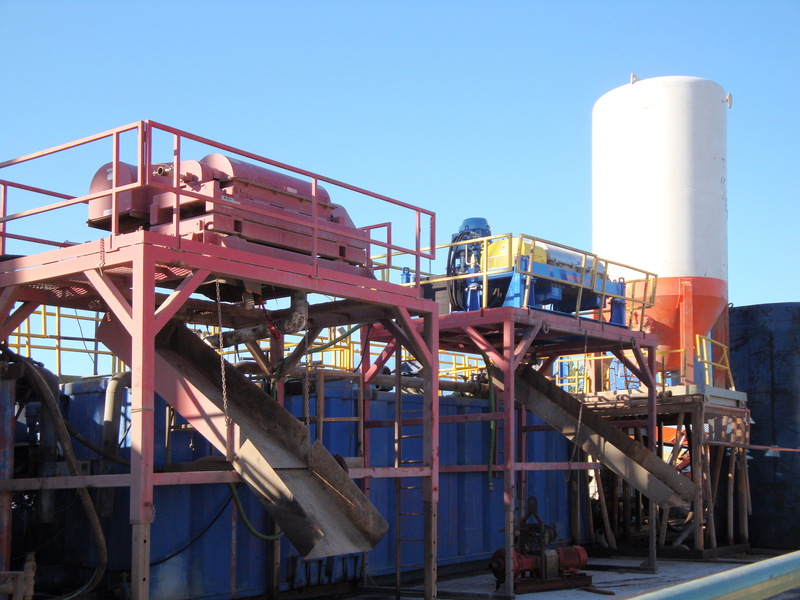 Drilling mud contains grit; it slowly grinds the wearing surfaces of the centrifuge, and eventually enough metal is worn away that the centrifuge must be rebuilt. The wear rate is proportional to the g-force. At low speeds, the grit is ground into the metal at a moderate force, but doubling the bowl speed causes four times the wear rate. It cuts the service life to 1/4 of what it would be, and considering down time, easily increases the maintenance cost five fold. In addition, as the centrifuge wears, it loses metal. It unfortunately doesn’t lose it uniformly, and as it wears, it goes out of balance. As I discussed previously, imbalance means premature failure through excessive vibration. The sum of these factors is quality. A higher speed centrifuge has to be built to closer tolerances, with high strength corrosion resistance alloys, with the best wear protection available. You cannot upgrade a carbon steel, slow speed centrifuge into a high speed, high efficiency machine. Quality is not just a nice paint job and new bearings, it has to be built into the centrifuge. Concluding, when specifications for a centrifuge are written, centrifuge dimensions and speed should be provided, as well as a Sigma number calculation. Unless this is done, you can expect to end up with one of the lowest performance centrifuges in the oil patch, and you can expect your mud bill to be a good deal higher than it should be.